The Philippines is sinking! Certainly the buoys to the east of the Philippines indicate action, as the sea flood is dropping there, water on the rise! 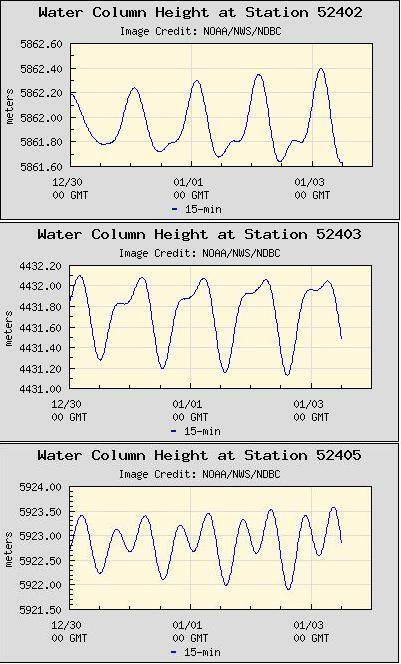 The buoys above New Guinea, in the Pacific, likewise indicate a rising sea level. What could this mean? There is indeed a relationship between the high waves and flooding in the Philippines in those towns along the eastern coastline and inland with access to the sea. The Philippines have begun to sink, though such sinking is never such that an entire land mass or large island sinks uniformly, so can be deceptive. There is an additional influence from the tilting of the Philippine Plate and continued compression out in the Pacific, so that water is heaped to the east of the Philippine Islands, and is washing over their eastern shores during equalization of the water level. However, this latter is a relatively small influence. The issue with flooding is absolutely due to a dropping in elevation for some parts of the Philippines.